(AKRON, OHIO) January 22, 2019 - The Cleveland Indians have announced the organization's staff alignment within its Player Development System for the 2019 season and the Akron RubberDucks' field staff is mostly a mixture of familiar faces, some from the playing field and some from the coaching ranks. 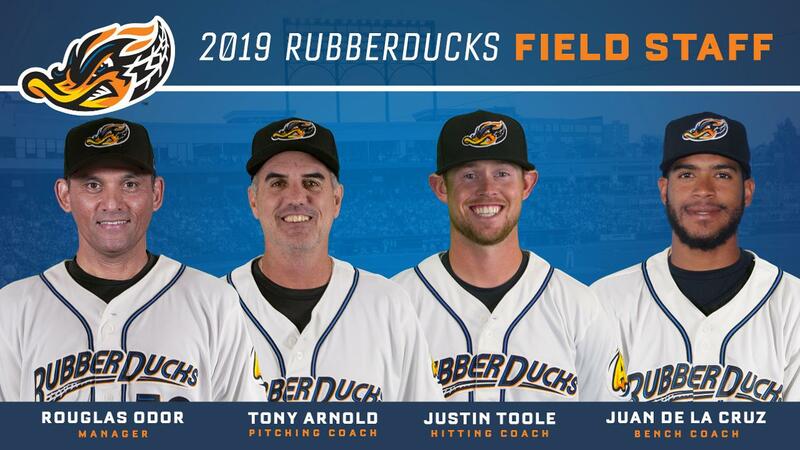 New manager ROUGLAS ODOR, who was the RubberDucks hitting coach in 2014, will be joined by pitching coach TONY ARNOLD and hitting coach JUSTIN TOOLE, both of whom worked in the same capacity under Odor in 2018 at High Class A Lynchburg. Also coming from Lynchburg is athletic trainer BOBBY RUIZ, who spent four seasons with the Hillcats (2015-18). Joining them will be bench coach JUAN DE LA CRUZ, who spent last season the hitting coach with the rookie-level Arizona League Indians and strength and conditioning coach PAUL SYNENKYJ is the lone returning field staff member from 2018. Odor, 50, becomes the 18th manager in club history. He follows Tony Mansolino, who led the RubberDucks to a 78-62 record and helped the team reach the Eastern League Championship Series where it fell to the New Hampshire Fisher Cats. Mansolino was promoted to manage Triple-A Columbus Clippers in 2019. Last season, Odor helped lead the Hillcats reach the postseason for the fourth consecutive season. After posting the Carolina League's worst first-half record of 29-38, the Hillcats rebounded to go 42-28 in the second half, claiming the CL's Northern Division title. They fell to Potomac in the semifinals, three games to two. He has a 361-363 (.499) career managing record in 11 seasons. Odor has the distinction of becoming the first person to wear the uniforms of the Canton-Akron Indians, Akron Aeros, and Akron RubberDucks when he was the club's hitting coach in 2014. He played 197 games for Canton-Akron during the 1991, 1993-94 seasons, and he was the hitting coach for the Aeros' 2012 Eastern League Championship squad. "I'm excited to be back in Akron. I was a player there, a hitting coach there, and now I have an opportunity to manage there. It's amazing!" said Odor. "I know many of the places and people there, so I can't wait to get started." The 2019 season will be Odor's 32nd in the Cleveland organization as a player or coach (19th season as a coach). Originally a 32nd-round draft pick by the Indians in 1988, the former shortstop played in the minor leagues for the Indians from 1988-94 and for the Milwaukee Brewers organization in 1995. Last season was Odor's first as a manager since 2008. He managed San Felipe in the Venezuelan Summer League for two seasons in 1999-2000, the Burlington Indians for four seasons from 2001-04, the Mahoning Valley Scrappers for two seasons in 2005-06, and the Gulf Coast League Indians for two seasons in 2007-08. Since then, Odor has moved up the ranks has a hitting coach, starting with Class A Kinston in 2009-10, Akron in 2011-12 and 2014, the High-A Carolina Mudcats in 2013, and Triple-A Columbus in 2015-17. "My main goal is to develop big-league players in a winning atmosphere," said Odor. "I know the minors are about player development, but I want to teach them the right way to win ballgames because at the big-league level, it's all about winning." The Maracaibo, Venezuela, native resides in Winter Haven, Fla., with wife, Milagros. He has three sons and is the uncle of Texas Rangers infielder Rougned Odor. Pitching coach Arnold, 59, rejoins the RubberDucks for his fifth time in Akron after spending last season with Lynchburg. In 2018, the Hillcats pitching staff finished fifth in the CL with a 3.76 ERA, ranked second with 1,190 strikeouts and the 12 team shutouts ranked fourth. Arnold last was with the RubberDucks in 2016-17, helping lead the 2016 team to an EL championship. He previously served in the same capacity in Akron from 1996-99, 2008, and 2011-12. Arnold's 2012 Akron Aeros staff crafted a franchise-record 3.03 ERA and went on to claim the Eastern League championship. In 2016, Arnold became the second man to wear the uniforms of the Canton-Akron Indians, Akron Aeros and Akron RubberDucks, joining new manager Odor in that exclusive group. In 2015, Arnold began as the pitching coach at Class A Lynchburg under Budzinski and finished at Triple-A Columbus, helping the Clippers to the International League title. A former All-American at the University of Texas, Arnold pitched in the major leagues with the Baltimore Orioles in 1986 and 1987. "Tony (Arnold) is a great pitching coach with a lot of experience," said Odor. "He has spent time with me in Venezuela in the Winter League and he is a tremendous coach." Hitting coach Toole, 32, joins Akron after spending the 2018 season as Lynchburg's hitting coach. This is fourth season coaching in the Indians' organization, serving as the hitting coach for Mahoning Valley in 2016, Lake County in 2017, and Lynchburg. Toole was signed as a minor league free agent by the Indians in 2009 and spent parts of seven seasons with Cleveland from 2009-15. He spent parts of 2010, 2012-15 with Akron, hitting .259 in 180 games, including .275 in 77 games under Odor's hitting-coach tutelage in 2014. The Council Bluffs, Iowa, native played at the University of Iowa and has authored a children's book called "9 in 9," chronicling the lessons he learned while playing all nine positions in a game for the Carolina Mudcats on Aug. 25, 2012. "I know Justin (Toole) is excited to be back in Akron. I'm happy he will be able to spend some time there (with family and friends). He's developed into a great hitting coach with a lot of energy and passion," said Odor. Bench coach De La Cruz, 25, enters his second season coaching with the Indians after serving as the hitting coach for the rookie-level Arizona League Indians in 2018. Primarily a catcher in his playing days, De La Cruz was signed as a free agent by the Indians in 2009 and spent eight seasons in the system, reaching Akron in 2017 where he played 12 games as a catcher and first baseman. He was a .216 career hitter in 281 games. Athletic trainer Bobby Ruiz makes his first stop in Akron following spending the last four seasons (2015-18) with Lynchburg. It will be his ninth in the Indians system. "Ruiz is one of the best trainers I've been around," said Odor. "I'm happy and excited to work with him and the rest of the staff from last year." Strength and Conditioning Coach Paul Synenkyj is entering his ninth season in the Indians organization and third consecutive with Akron. Synenkyj oversees the team's strength and conditioning program. Synenkyj holds degrees in physical education from Cleveland State and Akron. The Akron RubberDucks are the Double-A affiliate of the Cleveland Indians. The 2019 season, powered by FirstEnergy, will be the franchise's 23rd since moving to Akron. The 2019 Home Opener is on Thursday, April 4, at 6:35 p.m. vs. Altoona Curve.